The Jana Andolan Party has threatened a dharna in Delhi demanding that BJP MP from Darjeeling S. S. Ahluwalia table a bill on Gorkhaland statehood in the Lok Sabha. The demand from the fledgling rival of the Gorkha Janmukti Morcha has come at a time when Bimal Gurung's party is gearing up to stage a dharna for Gorkhaland in Delhi next month. The move by the Harka Bahadur Chhetri-led Jan Andolan is being seen as an attempt to put pressure on the Morcha and the BJP. The Jana Andolan has also decided to hold a dharna in front of the Assembly to demand land rights for workers of tea and cinchona plantations in what appears to be an attempt to simultaneously keep up pressure on the state government, which is against Gorkhaland. The party's national bureau met here yesterday evening and decided to hold the dharna in Delhi during the on-going winter session of Parliament. "The Morcha got Ahluwalia, and before him Jaswant Singh, elected from Darjeeling on the issue of Gorkhaland. We were told Jaswant could do precious little because at that time a non-BJP government was at the Centre. Now when both the MP and the government are of the BJP, what is preventing a bill on Gorkhaland from being tabled in Parliament? We will stage a dharna to put pressure on Ahluwalia to table the Bill in the Lok Sabha," Chhetri said. On the eve of the Assembly election in April, the party had presented to Ahluwalia and Morcha president Gurung a draft bill on reorganising Bengal by carving out parts of the Dooars, Terai and the Darjeeling hills and dared them to ensure its tabling in Parliament. "The MP has been silent on the bill, and the Morcha does not have the capacity to force his hand. No party should be allowed to indulge in its politics of lies time and again. 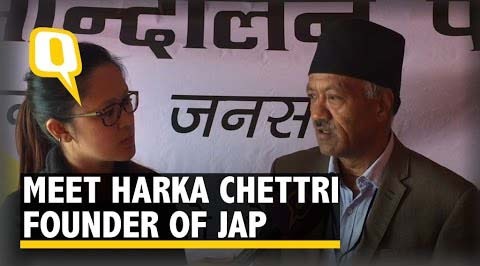 We will create pressure on the MP and compel him to table the bill," Chhetri said. Jana Andolan secretary Nayan Pradhan said the venue and dates of the dharna were yet to be finalised. "What is certain is that the dharna will be held in Delhi sometime in December," he said. The party, he said, has also decided to hold a dharna in front of the Assembly simultaneously with its Delhi protest, seeking land rights for workers of tea and cinchona plantations and to protest political killings in the hills. An observer said the Assembly dharna appears to be an attempt by the Jan Andolan to distance itself from Trinamul, which has been trying to get a toehold in the hills by riding piggyback on creating boards for various hill communities. The Morcha made light of its rival's campaign, terming it as an attempt to hoodwink people. "The Jan Andolan was never formed for Gorkhaland. It is a party which is aligned to the Trinamul that is against the formation of Gorkhaland. This is nothing but an attempt to hoodwink the people," said Roshan Giri, the Morcha secretary.